"The simplest, most elegant side dish ever! This is the best way to impress company without any extra effort. 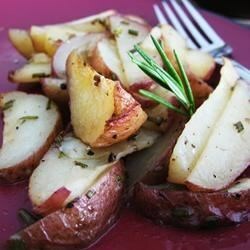 Substitute 1 teaspoon dried rosemary if you do not have fresh rosemary. Bon appetit!" Mix together melted butter and oil, then pour into a 9x13 inch baking dish. Place the potatoes into the dish, and stir until coated. Sprinkle with rosemary, salt, and pepper. Cover with aluminum foil. Bake in the preheated oven for 30 minutes, or until the potatoes are tender. Stir the potatoes occasionally to ensure even cooking. A simple side dish that’s impressive enough for holidays and guests. I used only olive oil and some cooking spray for a low fat option. I also cooked it 30 minutes covered and 10 minutes uncovered for a more roasted taste - Awesome! Easy, fast and delicious. These potatoes go great with just about anything. I lined my roasting pan with tin foil so clean-up was a snap. A very easy and tasty dish! I used olive oil in place of the oil and butter and added some chopped thyme and parsley too for added flavor.